The Washington State University Brass Quintet is the resident brass quintet in the School of Music. The group performs on campus each semester and enjoys performing state-wide for schools, universities, and community concert programs. Each year the quintet tours Washington high schools and offers performances and master classes for brass students. Fluent in many styles, recital programs include literature ranging from the Renaissance period all the way to the twenty-first century. The quintet is committed to reaching out to music enthusiasts throughout the Pacific Northwest. Members of the ensemble are in demand as performers, teachers, and adjudicators. 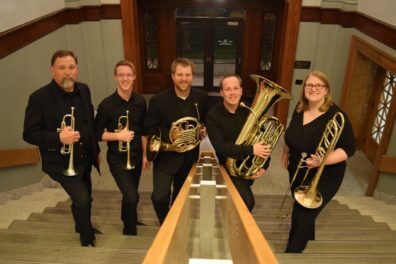 Individuals in this ensemble come from varied performance backgrounds, including the Chelsea Symphony, the Kansas City Symphony, the Washington-Idaho Symphony, military bands, brass bands, international competitions, and each of them has extensive chamber music experience. It is these varied performance experiences that help this group to perform quality music and present it to audiences around the region. For more information or if you would like to schedule a performance for the quintet, please contact Dr. David Turnbull.